Ann Duffy has been working at the intersection of mega-sports events and sustainability for more than a decade. She was hired as Chief Sustainability Officer for the 2010 Vancouver Winter Olympic and Paralympic Games. Since then, Ann has been involved in some way, shape or form with the sustainability efforts for several of the Olympic/Paralympic bids, as well as with the successful United Bid of Canada, Mexico and the United States to host the 2026 FIFA Men’s World Cup. No one is better positioned to talk about sustainability and mega sports events than Ann Duffy so GreenSportsBlog is honored to offer this two part interview. In yesterday’s Part I, Ann shared how mega-sports events are in her blood, how she came to lead the sustainability efforts at the 2010 Winter Olympic and Paralympic Games and what she and team were able to accomplish there. Today, in Part II, we examine Ann’s post-Vancouver 2010 work with a variety of Olympic and FIFA World Cup bid and organizing committees. We also discuss what future bid and organizing committees can do to engage fans on climate change and other environmental issues. GSB: Kudos to you and the Vancouver 2010 Organizing Committee (VANOC) team for advancing mega-event sustainability. What did you do for a follow up act once the Olympic Flame was doused? Ann: Thanks! Like I said before, this was the best job I ever had. It was also incredibly intense. Once the Games were over I decided I didn’t want to work in such a cauldron. So in 2010, as my work with VANOC wound down, I started quietly to build The Ann Duffy Group as a sustainability-focused consultancy to mega-event bid and host committees, with an emphasis on the broader, ESG definition of sustainability. The organizing committee for the 2014 Sochi Winter Olympics reached out in June, 2010 and asked “Can you help us more fully reflect environmental, social and governance goals of the IOC? GSB: I’m sure you could and did help them. My question is did the Russian authorities allow the sustainability plans to actually be implemented. Aside from the insanity, in my view, of awarding a Winter Olympics to a Mediterreanean-like city on the Black Sea, it sure looked like the Russian government engaged in a serious greenwash. Was that the case? Ann: Well, I worked with the Sochi committee for one year until the fall of 2011. My experience with my Russian colleagues was incredible; they were totally committed. We put together a sustainability management system including an environmental protection program, a process for sustainable procurement, and a new sustainability reporting structure. GSB: They didn’t have one in place? Ann: No. Sadly, the program didn’t get fully implemented and the sustainability team was terminated 18 months before the Games. It’s just different in Russia, obviously. I mean, there was no warning in the run up as to how they would turn on the LGBTQ communities the way they did. GSB: That was awful…and not surprising. Ann: Thankfully, Canada showed how it’s done by having a Pride House at Canada House in Sochi. And the Deputy Mayor of Vancouver at the time went to Thomas Bach, head of the IOC, and pressed him to ensure that the IOC would expand the Olympic Charter to address LGBTQ issues and they did. On sustainability, I worked on the IOC’s Sustainability and Legacy Commission as part of the development of its Agenda 2020 (a strategic roadmap for the future of the Olympic movement). GSB: Good job, Ann; good job, Canada! And despite the problems with Sochi that were way beyond your control, congratulations on getting The Ann Duffy Group up and running quickly. Ann: I was very blessed and very busy. From 2013 to 2015, I worked with the local organizing committees of three, count ’em three mega-events, all of which were happening in Canada in 2015. GSB: I know about the 2015 FIFA Women’s World Cup; what were the other two? Ann: The Canada Winter Games were held in Prince George, BC in February of that year. Then the FIFA Women’s World Cup were held across Canada^ in June-July. And then Toronto hosted the Pan Am Games in late July. GSB: That’s a mega-event trifecta right there! Did you get any sleep? Ann: Not much. Especially when you factor in that, in 2013, I also was working on the sustainability aspects of Istanbul’s bid to host the 2020 Summer Olympics, which ultimately went to Tokyo. GSB: Why do you think that was the case? Ann: It comes down to the opportunities and preferences of leadership, plain and simple. GSB: I guess. But if mega-sports events are really going to lead on sustainability, what can be done to ensure environment and climate are never relegated to the sidelines again? Ann: I think the prevalence of visible best practices in Europe and other host cities and stadia that demonstrate responsibility for climate impacts, waste impacts, water and biodiversity will help. Environmental stewardship and respect for human rights are now bid requirements for FIFA and Olympic bids. North American professional sports leagues like the NHL, NFL, MLS and MLB are demonstrating leadership. 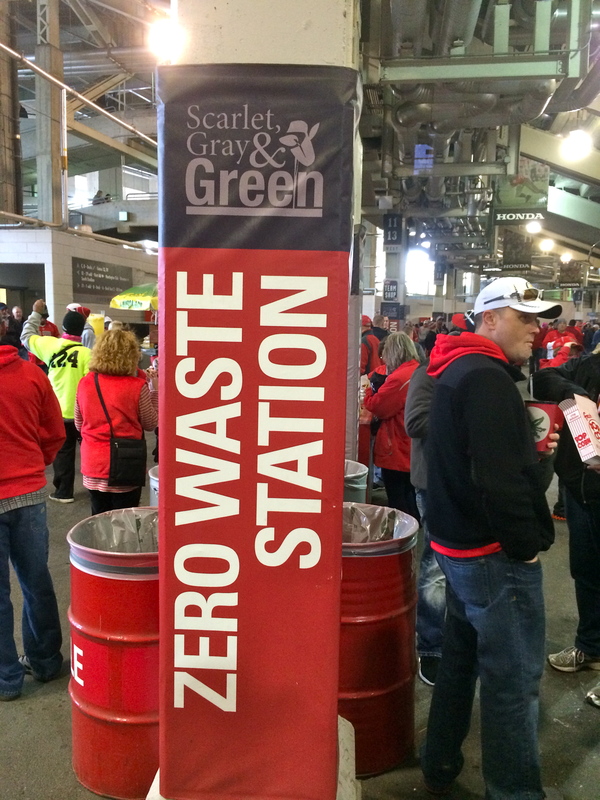 Stadium owners that have built or renovated stadia to green building standards like LEED are also leading on green operations and supporting community initiatives. GSB: Speaking of leadership, what kind of sustainability projects do you like to lead more: Bids or organizing committees? Ann: Good question. I guess I love both, but for different reasons. Creativity and “visioning” are crucial for bid work. Organizing committee work is also satisfying — it involves not only organizing and implementing but also coaching, and that means everyone from volunteers up to the C-suite. GSB: Talking about bid work, you consulted with one of the most sustainable mega-event bids to date, LA 2028. Ann: Actually, when I started working with them on sustainability it was the LA 2024 bid. But the IOC awarded Paris, another incredibly sustainable bid, those Games and slid LA to 2028. It was great to work with Brence Culp and the LA sustainability team. GSB: Brence is terrific. GreenSportsBlog interviewed her awhile back. Ann: LA 2028 is an example of what you can do sustainability-wise, when all the stakeholders get it: The city, county, state and local utilities were “all in”. So were the sponsors. GSB: It doesn’t hurt when most of the venues for LA 2028 already exist…You recently worked on another bid in which no new venues are needed, the United Bid between Canada, Mexico and the US that won the right to host the 2026 FIFA Men’s World Cup over Morocco. Ann: The environment, including climate change, along with community and fan engagement took central roles in both the United Bid and the LA 2028 bid. In addition to no new permanent venues, both have robust and sophisticated climate action plans that include new partnerships and collaboration with city and state utilities, public transit providers, stadia/venue owners. Host cities will showcase urban policies such as bold commitments to clean energy. GSB: What was your role on the United Bid? Ann: I was a sustainability-legacy advisor. It was a real sprint as the timeline was short but we were fortunate that FIFA had established a strong sustainability mandate. GSB: They needed to do that, especially in light of the mega-laundry list of mega-problems with Qatar 2022: Human rights violations, indentured servitude, deaths of perhaps as many as 1,200 construction workers building eight stadiums in a country of only 2.5 million people, stadiums that will have air conditioning even though they’re outdoor venues because of the country’s extreme heat…What did the sustainability mandate, well, mandate for the 2026 bid? Ann: It went deep, Lew. And the United Bid stepped up. GRI sustainability reporting, a climate action plan, ISO 2012-1 certification for sustainable events. Human rights, labor rights, ethical business conduct standards. Green Sports Alliance Board member Mary Harvey took the lead on human rights. I took the lead on the rest, working with the financial services firm Grant Thornton on ethical business and Arup, the global design and engineering firm, on some of the environmental aspects. GSB: I’m so glad you and Mary were on the case and that the United Bid won the day. Now I’d like to widen the lens a bit. You’ve been involved in the greening of the Olympics and World Cups from the early days of Vancouver 2010 through LA 2028. My main concern, as it is with the whole of the Green-Sports movement, is that most fans — attendees and the much bigger number who watch on TV or online — have no idea this is going on. None. Ann: Lew, I’m with you 100 percent! We need to do a much better job of using the platform of the Olympics or the FIFA World Cup to share the great greening stories with fans. GSB: So how do we ensure this happens? If Rio 2016 could have a climate change-themed vignette at the Opening Ceremonies seen by an estimated 1 billion people, why didn’t Pyeongchang 2018 do something similar? Will Tokyo 2020 or Beijing 2022 communicate something on climate to fans? Ann: Funny you mention Rio 2016. I helped on the Rio 2016 with communications during the actual Games. GSB: I would be surprised if you weren’t involved with Rio! Ann: I was fortunate to be at the rehearsal for the Opening Ceremonies. When the powerful climate change vignette came on, I started bawling. Mainstreaming climate change messaging was so…powerful. Incredible, really. GSB: So how do we make sure that climate change vignette is not a one off? Ann: And those young people want to have an exciting sport event experience. Young people expect responsible action that includes all of it — climate solutions, environmental solutions, diversity and ethical solutions. Sometimes these features will take the lead in the event experience and most of the time they will support the event experience. Mega-event hosts need to recognize this. Well executed, eco-themed fan engagement programs will go over well. Sponsor brands are already stepping up, as well. I am confident this will happen at Paris 2024, the United 2026 FIFA World Cup and LA 2028. SB: What about Tokyo 2020, Beijing 2022, and Qatar FIFA World Cup 2022? Ann: I’d love to say “yes” to the engagement question with those events but it’s a bit complicated. I haven’t worked with any of those mega-events so what I know about them is from a distance. As far as Tokyo 2020 is concerned, I know that, from a technical innovation perspective, the Summer Games will be at the leading edge of sustainability, from energy efficiency to tree planting and much more. On the other hand, from what I’ve heard, on social aspects of sustainability like LGBTQ issues, they’re not so advanced. And on fan engagement issues, I don’t know what they’re going to do. I do know that Pyeongchang 2018 did not follow the lead of Rio and communicate their greenness to fans. GSB: …Maybe the Beijing Organizing Committee will surprise in a good way. Speaking of 2022, what are your thoughts, sustainability-wise, regarding the aforementioned Qatar FIFA World Cup? Ann: The problems, human rights-wise and otherwise, have been horrible. And that Qatar was a weird choice in the first place given the size and climate of the country is an understatement. The one heartening thing is that, as we heard at the GSA Summit in June, there are some striking environmental innovations underway with the stadiums and the strong national commitment to renewable energy will be a part of the 2022 FIFA World Cup. GSB: I hear what you’re saying, Ann, but I guess, as the expression goes, I’m from Missouri on Qatar: Show Me! At least it looks like environmental sustainability will play a big role at the Paris 2024 Summer Olympics, the United 2026 FIFA World Cup and the LA 2028 Summer Games…What do you think? GSB: What does “net positive solutions” mean? Ann: That hosts will be adding more environmental assets and benefits to their communities and host region than they consume. GSB: I love that. Two things: 1. Paris and LA really should engage fans on “Net positive solutions” and 2. I only wish Pyeongchang, Tokyo, Beijing and Qatar went the “Net positive solutions,” mega-event route. Ann: Well, we know we need bolder leadership on sustainability engagement, in all walks of life, from business to government to mega-events. The progress on engagement at mega-events won’t be linear but, to paraphrase Dr. Martin Luther King, Jr., the arc of mega-events is long but it bends towards sustainability and engagement. IN TUESDAY’S PART I: Ann shared the story of her beginnings as an Olympics-loving girl in Western Canada through her time leading the sustainability efforts at the 2010 Winter Olympic and Paralympic Games in Vancouver. ^ Edmonton, Moncton (New Brunswick); Montreal, Ottawa, Vancouver, and Winnipeg were the host cities for the 2015 FIFA Women’s World Cup. About a month ago, GreenSportsBlog launched a new hashtag, #CoverGreenSports. Its goal is to encourage the mainstream media, from sports to green to news, to cover the sports greening movement. Last week, the US “paper of record,” The New York Times and lead NFL writer Ken Belson, stepped up to the #CoverGreenSports plate in a big way, with “Sports Stadiums Help Lead the Way Toward Greener Architecture”. The fourth week in May should be a quiet time for the lead NFL reporter at The New York Times. The draft, which took place in April, is already old news and training camps don’t open until late July. You would think this time of year is when NFL writers should be on vacation. But last week was a busy one for Ken Belson, proving that there is no such thing as a quiet period for the NFL. “The NFL and Nike Make Room for Fanatics,” detailed how the League expects revenue from merchandise sales to increase by 50 percent by 2030 through a new deal with Fanatics. But it was his third story that interested me most — and made me smile. In “Sports Stadiums Help Lead the Way Toward Greener Architecture,” Belson gave Times readers a terrific Green-Sports tutorial. Belson then took readers on a brief trip across the pond — “many of the innovations [in green stadiums-arenas] are being developed in Europe, where laws and regulations governing greenhouse gas emissions are stricter,” — before pivoting back to North America and the National Hockey League. GreenSportsBlog readers are likely familiar with much of this. And the folks quoted in Belson’s piece likely ring a bell. Yes, you may recognize Scott and Allen and the many other Green-Sports luminaries who have been featured in our posts these past five years, but the thing is, most humans have no idea who they are and are unaware of the important work they are doing. So it is very important that The (NOT failing) New York Times, with its massive reach and prestige, has decided to #CoverGreenSports with Belson’s piece. Does this foreshadow a trend? It should, especially since the millennial and GenZ readers that The Times — and for that matter, almost all media outlets — is desperate to engage, care more deeply about the environment, sustainability and climate change than do their predecessor generational cohorts. But it is, methinks, too early to tell. One potential brake on an increase in Green-Sports coverage from mainstream media outlets is that the topic crosses many areas — sports, green/environment, business, and politics, to name a few. That means that no one department claims natural ownership of Green-Sports and so no editor will assign a beat writer to cover it. What is more likely is that the hodgepodge we see now — a rare story by a sports reporter here and another one-off story from a business reporter there — will continue. With that in mind, we invite any visionary Green-Sports-minded editors to go through GreenSportsBlog’s archives to find a few hundred compelling story ideas to bring to their readers. The winner of the right to host the 2026 FIFA World Cup will be announced in Moscow on June 13 on the eve of the start of this year’s tournament. Sustainability is a key pillar of the first ever three-country bid from Canada, Mexico and the United States — aka the United Bid. Wanting to know much more, GreenSportsBlog spoke with Rita Ricobelli, Sustainability Director of the United Bid. GreenSportsBlog: So Rita, how does a woman from Argentina lead the sustainability effort for the United Bid — from Canada, Mexico and the USA — to host the 2026 FIFA World Cup (men’s)? Rita Ricobelli: Great question, Lew. Growing up in San Francisco, a small town near the city of Cordoba in Argentina, I developed a passion for soccer (or futbol), even though there were no soccer leagues in which girls were allowed to play … Nevertheless, I became a big fan of Boca Juniors, one of the two biggest teams in my country. RR: We don’t talk about them 🙂 Fast forward to early adulthood. Interested in global development, I got my Masters of International Affairs at Columbia University’s School of International and Public Affairs (SIPA). During that time, I formed an amateur soccer team, which is still part of the New York Women’s Metropolitan Soccer League. Given my passion for sports (I also grew-up playing tennis), my first job after graduate school was at a sports and media platform in New York City, which included the Pan-American Sports Network (PSN). GSB: What is the Pan-American Sports Network? RR: It was a Spanish-Portuguese language sports network in Latin America, with significant soccer content, as part of a sports media and marketing platform based in the US. It was a great working experience but the network was sold (a lot of its content was passed over to Fox). Then I pivoted again, workwise. GSB: What did that pivot entail? RR: I went to work for a New York-based educational NGO, then moved back to Argentina for a year, consulting for the Columbia Business School down there, where I also experienced sports in a fascinating way that was new to me: to engage at-risk youth. I came back to New York in 2006, determined to work on Sustainable Development and the potential application of sports in this quest. In 2007, I joined Columbia’s Earth Institute. RR: …At the time, yes. I was hired by the Earth Institute to help manage its international research, education and applied-research initiatives, including the Millennium Villages Project (MVP), a very ambitious endeavor based on the UN’s Millennium Development Goals. The MVP involved multidisciplinary scientists and collaborators working alongside more than 100 communities, mainly in Africa, on health, agriculture, education, infrastructure, and business development projects. Community engagement, in some cases, was a challenge, and that is when I proposed the use of sports, particularly soccer, as an engaging platform. Many academics were skeptical about linking scientific projects with soccer. But, some understood the opportunity and provided support, including Dr. Sachs, as well as Sree Sreenivasan, a visionary alum, and Dr. Safwan Masri. GSB: So how did you get from working on the Millennium Villages Project with the Earth Institute to managing sustainability for the United Bid of Canada, Mexico and the United States to host the 2026 FIFA World Cup? RR: My first involvement with a World Cup bid was in 2009, advising the U.S. bid team on an innovative proposition to combine soccer with social and environmental science-based projects. Together with Columbia University experts, we developed initiatives to work — through soccer — on STEM education and childhood obesity — through urban planning models — in the U.S. and on youth health and other sustainability areas in developing countries, to be included in the U.S.’ 2022 World Cup Bid Book. GSB: …”Bid Books” being another way to say proposal for an interested country or countries to be considered as a host of the FIFA World Cup…And the 2022 World Cup, despite a wonderful proposal, was awarded to Qatar. We could get into that decision by FIFA but that would take away from the focus of this story, the sustainability facets of the 2026 United Bid…so we won’t! RR: Yes. I am fortunate to have this extraordinary opportunity as part of the 2026 United Bid Committee of Canada, Mexico and the United States. The sustainability requirements for our current bid book are a lot more detailed and follow international sustainability standards more tightly prescriptive than in prior World Cup cycles, including new human rights and labor sections, as well as the application of international sustainability standards. GSB: Talk more about the 2026 bid — how it became a United bid, your involvement on the sustainability side, the bid’s highlights as they compare to your lone competitor, Morocco, and where things stand about six weeks away from the decision. RR: The 2026 FIFA World Cup will be the largest in the event’s history, expanding from the current 32 to 48 participating countries, and a total of 80 matches. Host countries will need to provide more stadiums and modern infrastructure as well as the ability to support larger populations of local/global fans. That is why Canada, Mexico and the United States came together in April 2017, to combine their resources, experience and capacity, to be UNITED, AS ONE. It has been an incredible sprint: an exciting and intense proposition, requiring a 24-7 commitment. We only received the final bid requirements in October last year, five months before the Bid submission deadline. GSB: …Holy cow! That’s only eight months before the bid will be awarded! Now I get your 24-7 comment! Had prior US bids had a sustainability director or is this United Bid a first? RR: It is a first and that’s largely thanks to John Kristick, executive director for the 2026 United Bid. He was already very supportive of the sustainable development agenda in the previous Bid (as managing director), understanding that sustainability is a key issue not only for the event but for the sport at large. He has an extensive track record in sports, particularly in soccer. Having a director of sustainability was in his management plan from the very beginning as he saw it as an essential role. GSB: I’ll say! What are the main sustainability initiatives for 2026? RR: The last three sections of our Bid Book, which your readers can access online (click here), are devoted to sustainability in its broadest definition. Section 22 includes our proposal for a sustainable event management system, based on ISO 20121, and other international standards. ISO 20121 takes into account social, economic and environmental areas, including governance and other aspects to sustainably manage the World Cup. Section 23 details our human rights and labor strategy, including an extensive human rights risk assessment. Section 24 is devoted to environmental protection and enhancement. As our Bid proposition does not include the need to build any new stadiums, we can then focus on other hosting priorities, including sustainability aspects. RR: Exactly. The three key themes of our bid are Unity, Certainty and Opportunity. The fact that all 23 stadiums in our bid — a list that will be culled down to 16 for the tournament — are already built is a foundation of its certainty. All stadiums will have an environmental certification by 2025, which is one of FIFA’s requirements. But, our commitment is to go beyond FIFA’s requirements. That is why we proposed a Sustainability+ strategy, looking to set a new standard for mega-sporting events and to maximize soccer’s contribution in achieving the UN Sustainable Development Goals. We will strive to offer an event that is carbon neutral and zero-waste, with no loss of biodiversity. Carbon emissions and water usage, as well as transportation will be managed from a best-in-class sustainability perspective. Healthy, sustainably produced food and beverage options will be available at all of our venues. Goods and services will be sourced via a sustainable procurement process. GSB: From what I understand of Morocco 2026’s plan, all of their stadiums will either need to be built or renovated, which is a massive difference between the bids, sustainability-wise and otherwise. As far as transportation is concerned, if history is any guide, getting people to and from the three countries will make up the lion’s share of carbon emissions for your bid. RR: You’re right. In fact 85 percent of emissions are projected to be transportation-related, with 51 percent resulting from international travel and 34 percent coming from inter and intra-city travel. Therefore, we have proposed a Carbon Management Plan, including reporting and reviewing of carbon reduction opportunities, training and awareness, offsetting and mitigation strategies. We will provide low-emissions transportation options for players, officials, the media, fans, and other visitors. Cycling and walking will also be encouraged. GSB: I expect that, by 2026, EVs and EBuses will be in far greater supply than they are now. Finally, it wouldn’t be a GreenSportsBlog interview about a mega-sports event without a question about fan engagement. Here goes: What is the 2026 United Bid team’s plan for fan engagement on environmental sustainability? RR: What a wonderful last question. We presented a Fan Engagement section, which was not part of the Bid requirements. Focused on sports for development, marketing and business, the section proposed the crafting of new approaches to connecting with fans, refining new methods of fan activation and testing what works and what doesn’t. In connection to sustainability, we hope to better harness the passion of fans towards sustainable development, which is a topic very close to my heart. I have worked with behavioral science experts, including Dr. Elke Weber, on opportunities to foster positive behavior change through sports, particularly soccer. A focus has been improving the communication of sustainability aspects to fans as well as their level of engagement on these issues. So, there are definitely a lot of interesting opportunities to further engage and empower fans to support sustainability. GSB: I look forward to discussing that platform in the not-too-distant future. Good luck in Moscow on June 13! RR: Thank you! I look forward to future discussions and tante grazie! Longtime readers of GreenSportsBlog know I believe that Green-Sports 1.0 — the greening of stadia and arenas — has been a great success. They also know I believe that Green-Sports 2.0 — engaging the 65-70 percent of humans who are sports fans on environmental issues, including climate change — is the more important yet far heavier lift. For Green-Sports 2.0 to have a chance of meaningful success, the media — sports and otherwise — needs to do a much better job of sharing the many inspirational Green-Sports stories with its sizable audiences. It says here that the media won’t do so on its own. So we, the GreenSportsBlog community, need to push them. And that starts today with the launch of the #CoverGreenSports hashtag. 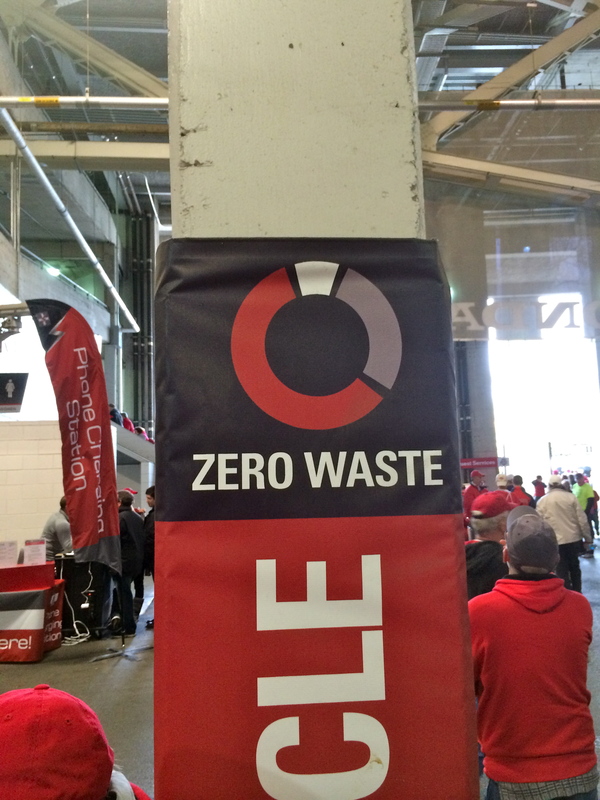 Zero-waste games — to qualify, stadia or arenas must divert 90 percent or more of food waste from the landfill — are increasingly commonplace, as are on-site solar panel installations, electric vehicle (EV) charging stations, and much, much more. #2: A precious few sports fans know about this: Despite an increased number of fan engagement efforts by a gaggle of teams and leagues recently, I would bet real money on the accuracy of this statement. In early April, I moderated “The Intersection of Sustainability, Sports and Business,” a panel discussion held at the NYU Stern School of Business and hosted by their Center for Sustainable Business. Before turning to the panel, I asked the audience if they knew that Ohio State home football games are zero-waste, that the Super Bowl offsets all of the direct emissions associated game, and more. Maybe two or three hands moved skyward in response to each question — a tiny number considering there were 50-60 people in the room. We need to get awareness about Green-Sports waaaaay up among sports fans. How high? Given the existential nature of the climate crisis I would be satisfied with awareness levels similar to the number of people who know that you can save 15 percent or more on car insurance by switching to GEICO! The only way we get that close to that exalted neighborhood is through significant sports media coverage of the great, sports-greening advances happening virtually every day in many corners of the sports world. Of course, the game is the thing during a broadcast, but it’s not the only thing. Environmental issues, especially climate change, need similar oxygen on sports broadcasts, no matter the medium. But that won’t happen unless the broadcast and cable networks airing sports events, along with the websites, newspapers, and magazines that write about them believe there is an audience for environmentally themed content. That means green-minded sports fans are going to have let the ESPNs, the CBS Sports’ of the world know that the sports-greening movement is important to them. That also holds true for sports websites like TheRinger.com and SI.com, news websites like npr.com and Slate.com as well as sustainability-focused sites like GreenBiz.com. Fans should reach out to sportscasters who are active on social media and who are known for speaking about issues beyond the playing field. Bob Ley (@BobLeyESPN), the long-time host of ESPN’s “Outside The Lines,” is Exhibit A. Peter King (@SI_PeterKing), the long time Sports Illustrated NFL writer, and author of the must read MMQB (Monday Morning Quarterback) column on SI.com, is Exhibit B.
Newscasters with an expressed interest in sports (there are a lot of them!) should also be contacted. Mike Pesca (@pescami), host of The Gist podcast — which tackles sports along with other topics — on Slate.com, needs to be in the know about Green-Sports. And Alabama Crimson Tide, Red Sox and Liverpool F.C. fanatic Joe Scarborough (@JoeNBC) should be added to the list. I’m sure you can come up with more. And that’s where #CoverGreenSports comes in. And — now this is really important — we also need to give BIG shout outs to those who ARE ALREADY COVERING Green-Sports and who may start to use the #CoverGreenSports hashtag. That is a small club for now but membership is growing slowly but surely. We can be the catalyst that accelerates the growth trend. I will tweet the #CoverGreenSports hashtag (and use it on Facebook, Instagram and LinkedIn) whenever appropriate – to “nudge” those who need to cover it or to “fame” those who already, wisely, are. Will you retweet? Are you with me? Of course we can’t just do this willy-nilly; a strategic approach is what’s needed. Since hashtags and connecting with influencers are not my bailiwick, I reached out to someone who lives and breathes strategic influencer outreach. Andrea Learned (@AndreaLearned) is a Seattle-based, self-described “communications strategist, with deep expertise in influencer relations.” Sustainability is one of her primary beats on Twitter. Andrea has made it a cause to generate interest in urban cycling-for-transportation by promoting the #Bikes4Climate hashtag as part of the broader #Cities4Climate movement. Suffice to say, while I will be on the lookout for new influencers to move the #CoverGreenSports hashtag, I realize I already am connected to a great group influencers — y’all! Your impact per minute spent has the potential to be massive! Mega-sports events like the Olympics, FIFA World Cup and Super Bowl have been greening in some way, shape or form for more than a decade. Waste reduction, LEED (or BREEAM or CASBEE) certification, measuring carbon footprint, and more. I got to thinking it would be interesting to talk to one of the companies that does the carbon footprint accounting — to understand how it works, what gets measured, what decisions, if any, are made to reduce emissions. So we were very happy to chat with Natalia Gorina and Franka Bosman of South Pole, a very interesting company that is one part sustainability consulting firm and one part emissions reduction project developer. There may be even more parts but this is good enough for now. Natalia Gorina and Franka Bosman have very cool job titles and even cooler missions at South Pole. Geneva, Switzerland-based Natalia’s is Sales Director, Carbon and Renewables. Sounds like a good fit for someone who describes her career as being “devoted to using economic incentives to solve the climate crisis.” With South Pole since 2014, Natalia helps corporations understand that it is good business to measure and reduce carbon emissions. She helps corporations talk the sustainability talk and walk the sustainability walk. Franka wants to “devote my life to improving the world by helping companies and people to take action against climate change.” Prior to coming to South Pole, Franka worked in finance, trying to disrupt it from the inside out. Natalia and Franka sure seem like they are in the right place. South Pole was founded in 2006 as a climate change fighting/sustainable business spinoff from ETH, a technical university in Switzerland. The company has since grown to over 200 employees with 16 offices around the world, with several located in Latin America, China and the Indian sub-continent where many emissions reductions projects are located. Those employees 1) help corporate clients source and develop emissions reductions and renewable energy development projects, 2) consult on sustainability strategy for corporations and, 3) manage their own carbon emissions projects that generate carbon credits that they then try sell to corporations. Fan participation levels were not as high as envisioned. Natalia attributes this to the complexity of the entry process: “Fans had to go through several steps to compensate for their emissions. It needs to be a super easy, one click process. Or, even better, have the offsetting option as the default position in the ticket purchasing process, from which fans can opt-out if they don’t want to participate.” South Pole will have the opportunity to collaborate with UEFA further on environmental issues, including hopefully improving upon fan engagement participation, with a four-year extension of its contract. That will take it through Euro 2020, the first tournament to be played across the continent rather than in one or two countries. FIFA, the governing body of world soccer, hired South Pole to measure greenhouse gas (GHG) emissions for the 2018 men’s World Cup in Russia. Will South Pole do an accounting of actual 2018 FIFA World Cup Russia emissions to see how they compare to the estimate? “Our assignment was just to do the estimate,” reported Natalia. If South Pole is engaged by FIFA and the organizers of the 2022 World Cup in Qatar, here’s hoping they get to report on the actual GHG emissions, and not just estimate them. Lord knows, a World Cup in Qatarian summer will be a massive environmental challenge (and that’s putting it mildly). Turning to motor sports, South Pole is helping members of FIA (Fédération Internationale de l’Automobile), the governing body for Formula 1, auto rallies, Formula E and more, to achieve carbon neutrality. GreenSportsBlog readers certainly know that my biggest pet peeve about the sports-greening world is that the fantastic stories about its greatest advances are not being told to fans and other stakeholders with a loud enough voice. Natalia and Franka agree. Since sponsor dollars are almost as vital as clean water to sports teams and leagues, Franka may be on to something. Watch this space. And keep your eyes on South Pole. CREDO Action is the advocacy arm of CREDO, a social change organization that offers products – like CREDO Mobile cell service – the proceeds of which allow it to fund grassroots activism and nonprofit organizations in support of a myriad of progressive causes and issues. Its customers and members — full disclosure: I am a member — have generated hundreds of millions of petition signatures, and tens of millions of phone calls and letters to elected officials and corporate bigwigs. On the environment, CREDO Action has, among other things, pushed the blocking of the Keystone XL pipeline, Arctic offshore drilling and coal leasing on federal lands^. Now it is venturing into the sports world, taking on the International Olympic Committee and Tokyo 2020 over the issue of rainforest destruction. Now that the curtain is down on the 2018 Winter Olympics in PyeongChang, the torch has been passed to Tokyo and the 2020 Summer Games. From a sustainability perspective, the organizers of Tokyo 2020 look to be on par with PyeongChang 2018 and their mega sports event predecessors of the 2010s while falling short, it says here, of the stellar sustainability standard set by London 2012. Tokyo earns solid scores on what now are considered green-sports basics (venues being constructed to green-building standards, use of EVs and hybrids, using locally-sourced produce, etc. ), and are making some incremental, newsworthy advances (making Olympic medals from recycled mobile phones, for example). And, as with PyeongChang, there are concerns surrounding the treatment of forests and the sourcing of wood for Tokyo 2020 venues. Writing in the May 11, 2017 edition of Vocativ#, Ray Lemire reported The Rainforest Action Network (RAN) claimed there is “evidence that the Japanese government is using tropical wood sourced from Shin Yang, a [large conglomerate with a logging operation] in the State of Sarawak, Malaysia, with a record of human rights abuses, illegal logging, and rainforest destruction.” To bring attention to this issue, RAN submitted petitions with 140,000 signatures to Japanese embassies and staged protests both in Malaysia and at the Olympic Stadium site. And now, CREDO Action is taking the advocacy baton from RAN, springing into, well, action, and engaging its members in a petition drive on the wood sourcing issue. “Tell the International Olympic Committee: No rainforest destruction for Tokyo 2020 Olympics” blared the headline of two CREDO Action petition drive mailings this week. “Tokyo Olympic authorities recently admitted that they are using irreplaceable rainforest wood in the construction of Olympic venues. [According to this February 2018 Rainforest Action Network story] at least 87 percent of the plywood panels used for Tokyo’s New National Stadium came from the rainforests of Malaysia and Indonesia. [T]he Tokyo [organizers] need to feel more pressure. We need the International Olympic Committee to use its influence to ensure that no more rainforests are harmed for the Tokyo Olympics. Japan is the largest importer of plywood from tropical forests, and half of that plywood comes from the Malaysian state of Sarawak on the island of Borneo. Sarawak has one of the highest rates of deforestation in the world, and Indigenous communities in Sarawak have been fighting logging for decades. Over a year after the information was originally requested by RAN and more than 40 other groups, Tokyo 2020 Olympic organizers have finally acknowledged extensive use of tropical rainforest wood to construct the New National Stadium (aka Olympic Stadium) and other venues. Instead of sourcing sustainable wood locally in Japan, the Tokyo Olympics authorities are devastating priceless rainforests and trampling the rights of Indigenous people to cut costs. Now, the question can reasonably be asked: Do petitions get meaningful results? By themselves, the odds, as the expression goes, are slim to none and Slim is on his way out of town. But petitions are an important tool in a grassroots movement’s tactical toolbox, along with peaceful demonstrations, letter writing, lobbying, boycotts and more. And, since the organizers of Tokyo 2020 are halfway around the world from North America, lending once’s voice to the cause via petition is the way for individuals here and elsewhere to take action now. The “NO RAINFOREST DESTRUCTION FOR TOKYO 2020” petition drive, which launched February 27, is over 92 percent of the way to CREDO Action’s announced goal of 75,000 signatures, with 69,400+ folks weighing in so far. Click here if you would like to sign and help bring the drive over the signature goal line. ^ Sadly, it says here, Keystone XL and Arctic offshore drilling have been revived by the Trump Administration. Coal leasing on federal lands is in the process of being re-allowed.